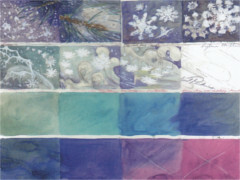 Color studies for the Waltz of the Flowers. The study was done by Sylvia Holland. On January 7th [377.0] I posted some concept art from Kay Nielsen. The piece was for a proposed Studio version of The Little Mermaid by Hans Christian Andersen. The second DVD of the special edition of The Little Mermaid reveals the influence Kay’s concept art had on the future masterpiece. It’s a nice tribute to Nielsen, who joined the Studio in 1939 (an ominous year oft-referenced at Limestone), and who was beset by adversity during his short stints at the Studio (and in the United States). It’s also worth mentioning that he worked on my favorite sequences of Fantasia— Ave Maria and Night on Bald Mountain. Coincidentally, Fantasia remains one of my favorite movies [364.1]. Scan and quote is from The Hidden Art of Disney’s Musical Years by Didier Ghey.